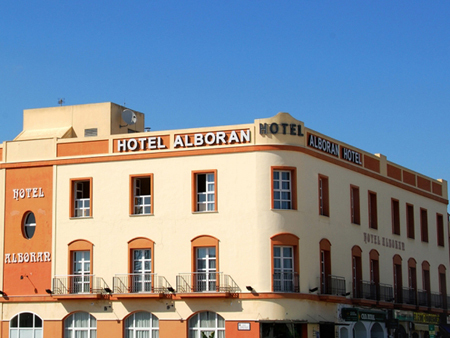 The Hotel Alborán "Chiclana" is located along the square Andalucia in the centre of Chiclana de la Frontera and a well known address at the "Costa de la Luz" and only 10 km away from the urbanisation Novo Sancti Petri. Its location is ideal for trips to the legendary and splendid beaches la Barrosa and Sancti-Petri, two sites of major interest in the area. Our hotel surprises with its modern style which is inviting and functional at the same time. Every floor is decorated in a different colour creating original contrast. A spacious and light entrance hall welcomes the client. Our hotels offers many services as: reservation of excursions, plane and boat tickets, car rental, 24 h reception, press, pc´s, printer and internet, private car park and wifi.